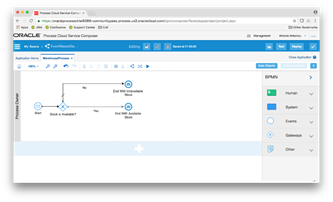 These capabilities have been available for quite some time in Oracle’s Process Cloud Service counterpart, the Oracle BPM Suite and have been described in detail in two of my blog posts; "Correlations in Oracle BPM 12c" and "Oracle BPM 12c Gateways (Part 5 of 5): Event-based Gateway". Even though the functional concept is the exactly the same, whether used in an Oracle BPM Suite process or an Oracle Process Cloud Service process, there are yet some small differences, especially with the "Event Based Gateway" in Oracle Process Cloud Service. Read the complete article here.